The Holiday season is officially in full swing and the stores are slowly getting rid of pumpkin spice everything in favor of mint everything. When I asked “Mr. Google” why mint was so popular at Christmas, the only straight answer I found was that candy canes started it. And even they didn’t start out minty. Further conjecture can connect mint to a “cooling sensation” that may remind us of winter and snow (if you live anywhere but Florida that is), or that it’s green and Christmas has traditionally been the season of green and red EVERYWHERE. But the only concrete anything that people can find is that the mint craze started out because of candy canes. But whatever the reason, mint is one of the Holiday Season’s biggest flavors. You can even find it in body products (body scrubs and sprays) and candles this time of year. But it does make a great herbal ally for this season. There are so many mint plants that they named the botanical family they belong to after them. The Mint family is also known as the Lamiaceae family and is characterized by a square stem, asymmetrical flowers, and opposite leaves (opposite leaves means that they grow on opposite sides of the stem). Peppermint (menthe peperita) and spearmint (menthe spicata) are the two most well known for their medicinal properties. Mint is great for easing a number of digestive complaints including nausea, flatulence, and diarrhea. Mint also helps alleviate bad breath, ease headaches and migraines, improves brain function, and can help break a fever. Mint can also help ease depression and anxiety. It’s also a stimulant that can give you a natural boost to alleviate fatigue. Mint makes a great tea and can be added to other teas to make their flavor a little more pleasant. Mint also makes a great essential oil. Adding a few drops of mint oil to some coconut oil or grapeseed oil and using it for massage can be great for relieving muscular pains, you can also dab the mixture on insect bites to help alleviate the sting and itching. You can even put a few drops of essential oil on your pillow at night to help prevent insomnia. 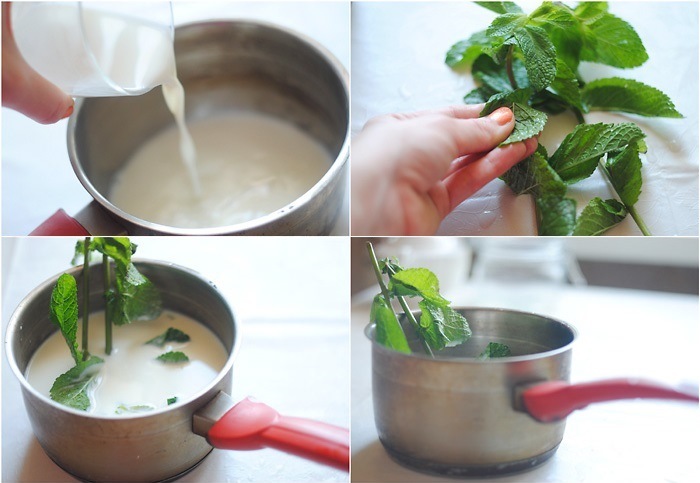 Mint tea is a tasty and refreshing hot tea for the holidays, but you can also make it with milk (or coconut milk) for an extra special treat. Just warm up 2 cups of milk, just under boiling, and add 5-10 fresh mint leaves (1-2 tsp dried). Remove from the heat and let sit, covered, for 15-20 minutes. You can drink it as is, or sweeten it to taste (I prefer to add a little honey to mine) and enjoy! You can even enjoy the aromatherapy, and muscle soothing benefits by adding mint essential oil to sugar or sea salt to make a great scrub for your skin. Just combine 1 ½ cups of softened (warm it up) coconut oil, 1 ½ cups sugar (or sea salt), and 15 drops of peppermint essential oil. You can add a few drops of food coloring if you’d like (2-4 drops of green makes a nice mint color) and you can also add in some vitamin E oil to increase the benefits for your skin. I tend to use sugar for lip scrubs and sea salt for body, but whatever works best for you is great! Enjoy your scrub after a hard day of holiday shopping, or for extra relaxation and exfoliation. Even though the reason for the mint craze during the holidays is not clear, mint is clearly a great plant. So feel free to make mint tea, or add a few leaves to your hot cocoa this season and enjoy.